(1) In successive possession of property, one possessor after another without a break. It is an important concept in adverse possession, which requires possession of property for a certain period of time before gaining title. Possessors who cannot meet the time period requirements are allowed to tack (combine) their time with earlier possessors who were in privity. (2) Having a direct contractual relationship between parties. 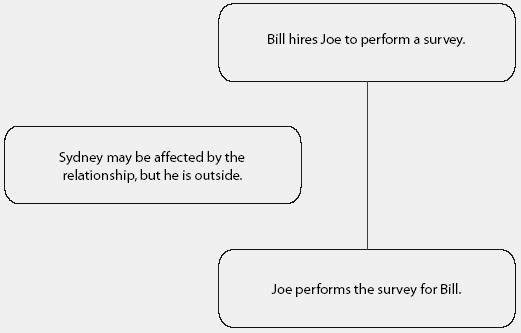 Example: If Joe surveys land for Bill, then Bill and Joe have privity. If neighboring property owner Sydney is unhappy with the results of the survey, he cannot sue Joe for breach of contract or failure to perform the survey properly, because there is no privity between Joe and Sydney. Other legal theories may get around that problem, but not a breach-of-contract action.